HF: Our recently posted article, Beryl Mining at Devil’s Peak, brought forward a comment from Fiona Soliman which I repost here: Thank you for a fascinating article. 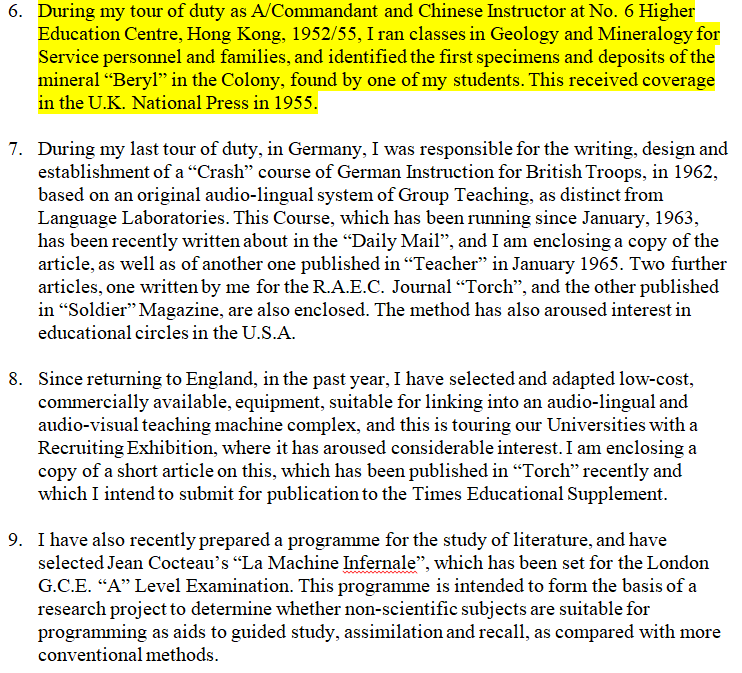 I am currently researching my family tree, and among some of my grandfather’s documents I discovered a mini-autobiography in which he explains that, while he served in Hong Kong with the RAEC in 1952-55, he ran classes in geology and mineralogy for service personnel and their families. There is no mention of Cpl. Harries by name [“an amateur geologist, Corporal William Bruce Harries, of the Royal Army Educational Corps discovered a deposit of Beryl at Devil’s Peak, and was immediately engulfed in sensational stories about the development and value of the find.” See our article: Beryl Mining at Devil’s Peak), but my grandfather did mention (in very modest terms) that the discovery was made by one of his students and that he himself “identified the first specimen and deposits” of beryl found in Hong Kong. I should mention that he was a very keen gemmologist and FGA, so he knew what he was doing. I wanted to learn more about the subject, and stumbled across this very enlightening article. HF: Intrigued I contacted Fiona to ask if she would be able to provide further information abour her grandfather, George Brewer and his possible connection to the discovery of beryl in Hong Kong and indeed the Devil’s Peak Beryl Mine. Before sending details of the aforementioned autobiography Fiona sent details of Mr Brewer’s background: The autobiography is, sadly, nothing more than a couple of pages with some paragraphs about my grandfather’s life. It is typewritten and the paper is quite faded, so I have typed it up in a Word file for you with some explanatory comments which I hope will be helpful, but please do let me know if you would like some further explanations of anything in it. I do not know for what purpose the document was produced, but it looks like a cross between an autobiography and a CV. It was written 2 years before George died, so we are lucky to have it. 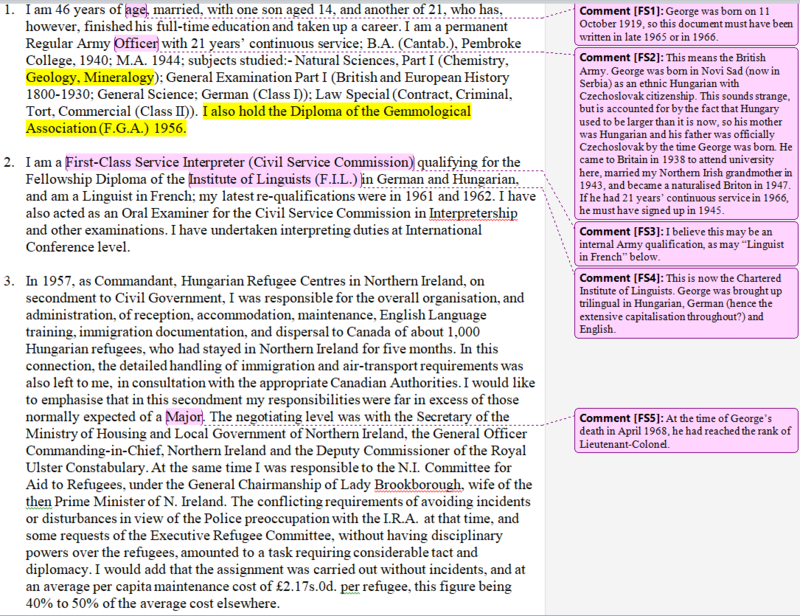 I would like to apologise for the use of “colony” in the document; it was written in 1966. I have highlighted in yellow the parts that are directly related to the topic of the Devil’s Peak article, but have given you all of it in case you find it interesting. My parents are currently on a choir tour in France, but I am hoping that I will be able to extract some further details from them next week. I imagine my father would be able to help with this, because he lived in Hong Kong with George at the time in question (1952-55). Please watch this space for a further update! To tell you what I already know (bearing in mind that I am still at an early stage in my genealogical quest), my grandfather was born György Pál Richárd Breuer in Novi Sad in October 1919, shortly after Hungary was carved up by the Treaty of Trianon. This explains why he was born in what is now Serbia to a Hungarian mother and what would now be a Slovak father. He anglicised his name to George Paul Richard Brewer (note the W) when he became a naturalised Briton in 1947. My parents have always said that it was because a German-sounding surname was “frowned upon” when he joined the British Army at that particular time. He was part of the Royal Army Educational Corps (RAEC), which was essentially the educational division of the British Army. He did a lot of work on developing language-training programmes and wrote a German course for the Army in the early 1960s. He was in Hong Kong in 1952-55, but unfortunately I do not know much more than you at this stage. I vaguely recall my father telling me that he had himself discovered some sort of mineral on a walk with George one day, and that they called it “Hugoite” because my father’s name is Hugo. Unfortunately, I am no scientist so I cannot be any more accurate than that, or say how it relates to the discovery made by Corporal Harries. I am hoping that my father will be willing to provide some more details about this and the rest of their Hong Kong adventures next week! George was awarded an MBE in the 1965 New Year’s Honours, and despite being very fit and active all his life he died of a heart attack in April 1968 at the age of 48, at Eltham Palace in south London, which is where the RAEC was based. I was only born in 1978, so I never had the pleasure of meeting him. HF:Now to Fiona’s typed version of extracts of Mr Brewer’s autobiography with her comments where she thought appropriate. Mr Brewer’s mention of the involvement of one of his students in the the identification of the first Beryl specimens and deposits in Hong Kong are exciting. As is his mention of this discovery in the UK National Press in 1955. I look forward to any additional information about Mr Brewer and Beryl mining in Hong Kong or mention in the UK newspapers in 1955.